(If necessary) Prepare the modular system and server module. See Prepare the Modular System and Server Module. (If necessary) Install any optional components. Remove the protective cover from the rear connector of the server module. Locate the slot in the chassis where you plan to install the server module. A filler panel should remain in this slot until just before you are ready to insert the server module. All slots should remain filled with server modules or filler panels to ensure correct air flow, heat, and electromagnetic interference conditions in the modular system. Remove the filler panel from the selected chassis slot. Pull down the ejector arm of the filler panel, then pull the panel straight out of the chassis. Caution - Be ready to insert the server module within 60 seconds of removing the filler panel. Use both hands to position the server module vertically with the ejector arms on the right (panel 1). Push the server module into the empty slot until the module extends about 1.5 cm (0.5 inch) from the chassis front (panel 2). Pinch the ejector levers to open them (panel 2). 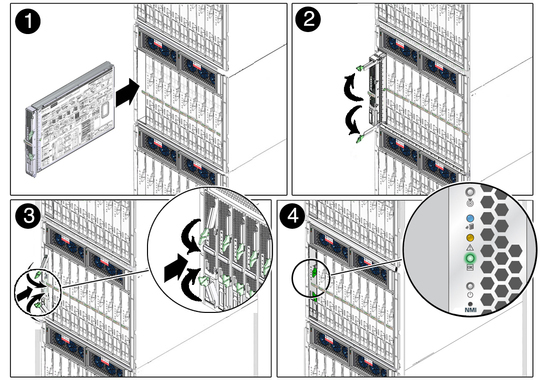 Push the server module into the chassis and close the ejector levers (panel 2 and 3). Monitor status messages when power is applied to the server module (panel 4). As soon as you insert the server module into a chassis that is connected to power, the server module goes into standby mode and its SP initializes. The front panel LEDs blink three times, then the green OK LED on the front panel blinks for a few minutes. See Front and Rear Panel Components.